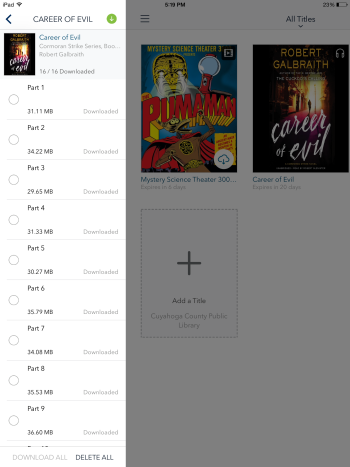 If you're having trouble with a title or want to free up space on your device, you can delete the files for a title from the OverDrive app without returning it to your library. Select the icon in the top-left corner to open the Home menu. Select Delete all to remove the files for that title from your device. The title will still appear on your app bookshelf and Files screen, but its files will be deleted from your device. 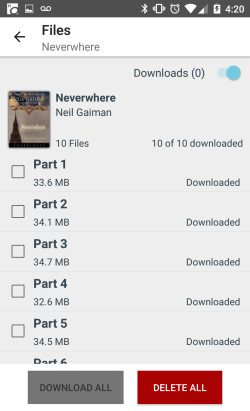 To re-download it, select the title on your app bookshelf and follow the prompts. Tap Delete all, or tap individual parts, then Delete. The title will still appear on your app bookshelf and Files screen, but its files will be deleted from your device. To re-download it, tap the title on your app bookshelf and follow the prompts.